Bou, E.; Vidal, D.; Sedwick, R.; Alarcon, E.
Resonant Inductive Coupling (RIC) Wireless Power Transfer is a key technology to provide an efficient and harmless wireless energy channel to consumer electronics, biomedical implants and wireless sensor networks. However, there are two factors that are limiting the applicability of this technology: the effects of distance variation between transmitter and receiver and the effects of interfering objects. While distance variation in WPT has been thoroughly studied, the effects of conductive interfering objects in resonant inductive coupling links are still unclear. When a conductive element is in the vicinity of a RIC link, both the transmitter and the receiver can experiment a change on their resonant frequencies as well as their impedances. This can greatly affect the effciency of such WPT link causing it to a) make the transmitter and/or receiver act as a pass-band filter and b) loose part of the transmitter magnetic field through coupling to the interfering object. Depending on the natural resonant frequency of the object and the distances between this object and the transmitter and receiver antennas, this can affect significantly the RIC wireless power transfer link. In this article, we characterize the Magnetic behavior of a resonant inductive coupled link in the presence of a conductive interfering object using a Finite Element Field Solver (FEKO). Several distances between interference and transmitter/receiver are analyzed providing a design space exploration and applicability study of this link. Resonant Inductive Coupling (RIC) Wireless Power Transfer is a key technology to provide an efficient and harmless wireless energy channel to consumer electronics, biomedical implants and wireless sensor networks. However, there are two factors that are limiting the applicability of this technology: the effects of distance variation between transmitter and receiver and the effects of interfering objects. While distance variation in WPT has been thoroughly studied, the effects of conductive interfering objects in resonant inductive coupling links are still unclear. When a conductive element is in the vicinity of a RIC link, both the transmitter and the receiver can experiment a change on their resonant frequencies as well as their impedances. This can greatly affect the efficiency of such WPT link causing it to a) make the transmitter and/or receiver act as a pass-band filter and b) loose part of the transmitter magnetic field through coupling to the interfering object. Depending on the natural resonant frequency of the object and the distances between this object and the transmitter and receiver antennas, this can affect significantly the RIC wireless power transfer link. In this article, we characterize the Magnetic behavior of a resonant inductive coupled link in the presence of a conductive interfering object using a Finite Element Field Solver (FEKO). Several distances between interference and transmitter/receiver are analyzed providing a design space exploration and applicability study of this link. Bou , E. [et al.]. Magnetic characterization of interfering objects in resonant inductive coupling wireless power transfer. A: Progress in Electromagnetics Research Symposium. 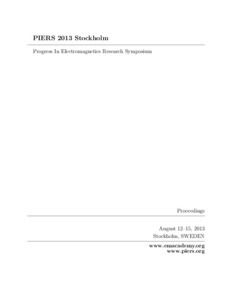 "PIERS 2013 Stockholm - Progress In Electromagnetics Research Symposium: proceedings: August 12-15, 2013: Stockholm, Sweden". Stockholm: The Electromagnetics Academy, 2013, p. 1554-1559.